As the Breeze city becomes bit hot ...all awaiting here in Edgbaston where India and England are ready for the heated up contest. I believe England are missing some trick here as Moen Ali is far better batsman than Rashid and also with the fact he sometimes he gets Virat Kohli and Jinx out which will be a massive thing in regard to this series. Have you noticed what makes it tough for England is not just about winning a phase of a match but to equally consistent throughout the summer which they have never imagined. With around 23 Degree Celcius in the city...having said it hot what it replicates its humid more which will result in more running for water.Humidity is 56%. As far as history, it is all against India but wheather now is supporting India more.Playing without Pandya and going in with 3 quicks and 2 spinners will be ideal as we need to be desperate to make a statement in that unusal collapse is always available for England. With A Cook being in the fag end, playing second feddle in most cases and unsettled openning pair also inexperienced middle order revolving mostly around Root shows that its not only for Virat but also for Root to stay uprooted. Broad has now crossed all border to reach here with willingness to live upto it.Its all between to ensure England in safe hands as since 2013 they both rounded around 300 wickets in switches...partly missing Wokes who is under scanner. 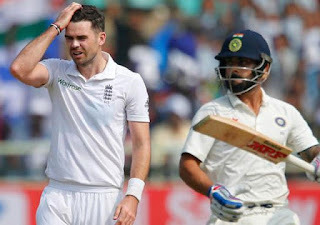 People say Pressure on Kohli---> did u imagine the situation of Anderson,Broad,Cook,Root...with only four of the rest are standing tall from 3 years its all pressured to get this Indian team mocked down. Also its not about Individual performances more in this side as everyone contributed in a way they are far more balanced and power force compared to England. They some how got away with tough situations as players take responsiblity and make a move.Its been 0-1, 150-0, 150-5, 200-7 all these ended up around 400 which is the art of test match scoring. Considering the fact Stokes have been around a case in the middle of the series which also will lead to some problems for Root. As Ashwin and Jaddu can make it up all with bat too...he is not need to be directly stranded in. With low consistency rate England will go down by this standard as they only won 10 of the last 30 test matches in England. Who will be in pressure Root or Kohli...have chase master have all seen the situation before??? Any team will be looking to Bat first in this match as ball starts turning from 2.5 days of playing unless it is more flat wicket than that.